This is a bath salts recipe you can give to anyone who enjoys soaking in the bath – both the women and the men in your life. The spicy fragrance is warm and comforting, and there’s no need to buy essential oil. A glass or plastic sugar shaker jar makes a nice dispenser for these spicy bath salts, but you could recycle a plain glass jar instead. If desired, decorate the jar with our free printable jar label. Note: Anyone who are allergic or sensitive to herbs, spices, or essential oils should exercise caution or avoid using this recipe. and half sea salts to almost fill a glass sugar shaker jar, then add approximately 1 tsp cinnamon, 1/2 tsp ground ginger, 1/4 tsp ground cloves and two heaped teaspoons of brown sugar for each cup of the salts. Empty into a mixing bowl and, if you like, thoroughly stir in a few drops of red and green food coloring to enhance the golden brown color. Tie a few lengths of raffia around the neck of the jar, and remember to seal it with the inner plastic cap before screwing on the metal lid with holes in it. 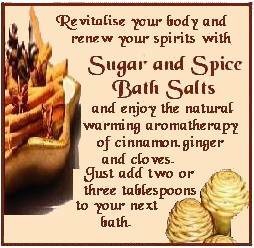 Print our free Sugar and Spice Bath Salt Label, shown at left. Cut the label out, coat with a glue stick or craft glue and stick firmly to the front of the bottle.